A few weeks ago, a little yellow app came into my life and quickly became my favourite method of procrastination. It's now gone past that stage and catching up with it is a regular part of my day. I'm talking about Snapchat! 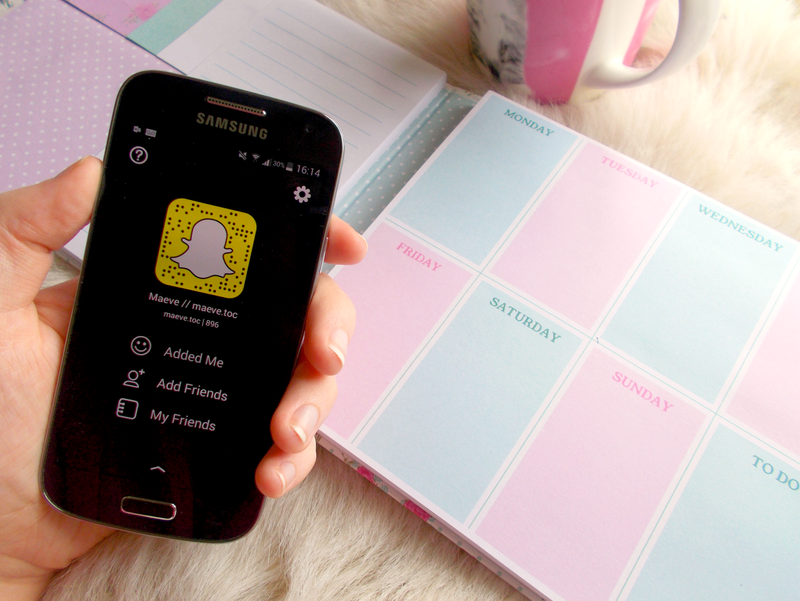 Today I want to share some of my favourite Snapchatters that I really recommend you follow! Sera has a fabulous sense of sarcasm and this super relatable, girl next door quality that you're bound to love! Her blog is a highly recommended read for all things style, beauty & wellness. Added bonus: her adorable puppy Kim! If you're a fan of Cocoa Brown tan, you may know of Marissa - she's the founder! Since I started keeping up with her stories I've felt inspired daily by her & the motivational quotes she shares. I'm not a tanner but such is the power of Snapchat, I really wanted to support her in some way so I'm currently waiting on a bottle of Cocoa Brown Tough Stuff exfoliator coming in the post with my Feel Unique order! I first came across Sharon's blog when we both took part in #IrishBlogCollab and it's always a pleasure watching her snaps. She's the definition of down to earth and is always chatting about something that'll make you laugh, for example all of the hilarious misheard lyrics she's been sharing lately! Polly genuinely amazes me at how much she's achieved and constantly continues to achieve. It's so lovely to get a little 'behind the scenes' peek at her illustrations in her stories! You'll never be bored watching her snaps; a personal favourite of mine was when she visited the Harry Potter studios - oh me oh my. Oh and if you like incredible food, you will not be disappointed! Well I hope you enjoyed this post! Get involved in the comments below and feel free to share your Snapchat username if you'd like to. Mine is maeve.toc if you want to keep up with my stories! Who are your favourite Snapchatters?